Who Is Up Next in Australian Skiff? For as long as the 49er class has existed, the Australia Sailing Team has performed at the highest level. From Chris Nicholson winning the classes’ first three World Championships, to Nathan Outteridge & Iain Jensen taking gold and silver in London and Rio, it’s fair to say that the 49er sailors from down under have been a force to be reckoned with. We sat down with Australian 49er coach, Euan McNicol and squad members David & Lachy Gilmour to dive deeper into the current state of the Australian 49er team. It was no secret that for the past ten years it would take two sailors of exceptional caliber to knock Nathan Outteridge & Ian ‘Goobs’ Jensen from their spot at the top of the Australian 49er team. Many tried. None succeeded. And after their well-earned success, which spanned the better part of a decade, Outteridge and Jensen stepped away from the class to concentrate on other campaigns, such as the America’s Cup, Nacra 17, SuperFoiler and SailGP. With Outteridge / Jensen’s departure following the Rio 2016 games, there are some mighty big shoes to be filled in the Australian camp. Euan McNicol, the Australian Sailing Team’s 49er coach believes there’s a positive to this situation for their up and coming athletes. And success the Australian’s have had. In the 49er’s 21 year history, Australian sailors have won seven World Championships, four continental championships, an array of World level events and competed at every Olympic Games since its inclusion in Sydney, winning a Gold and Silver medal along the way. With multiple generations of success in the class, the new wave of Australian 49er sailors are well equipped to continue that performance. Australia is one of the most prolific skiff sailing nations in the world. Many of their youth feeder classes are high performance skiffs, and many of the countries best sailors hone their skills in boats such as the 16 and 18 foot skiffs throughout their sailing careers. With skiff sailing embedded in the culture comes a huge depth of talented young sailors pre-equipped with the skills needed to succeed in the 49er class. Amongst their current 49er sailors are three stand out teams vying for their chance to represent Australia at the Tokyo Olympic Games. 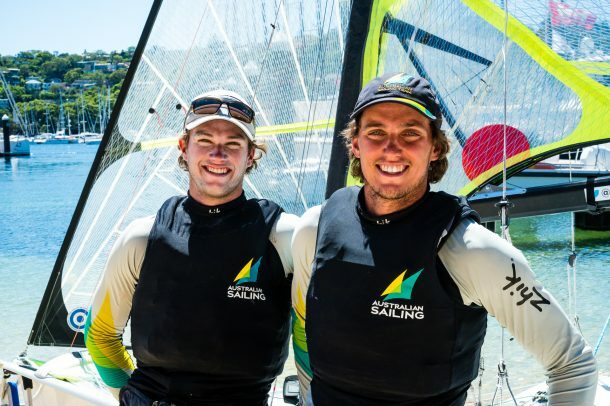 Long time campaigners, brothers Will and Sam Phillips from Victoria, are pushing hard to get themselves back up to speed after Sam sustained a foot injury during the SuperFoiler Grand Prix in early 2018. Will continued to compete on the 49er circuit in 2018, with Iain Jensen standing in as crew. Now back together, the Phillips brothers are in good stead having spent the majority of their extensive 49er careers sailing together. Joel Turner, who has been campaigning with helm David Gilmour for the past two years, has teamed up with young radial prodigy Tom Needham. “Tom is a young guy out of Queensland. He’s been an exceptional Laser Radial sailor and has had some really quick, high level results,” says McNicol. “He’s just a sponge when it comes to sailing knowledge. He’s so interested in every little detail and sometimes you’ve got to say ‘Tom, mate just relax, take it easy.” The 49er has become a very refined test of two people trying to operate a boat as one, and it is that kind of attention to detail that is required to become an Olympic champion. The third team is another sibling duo. David and Lachy Gilmour, sons of legendary match racer Peter Gilmour, have paired up for their run into Tokyo. Lachy has already won a Match Racing World Championship in 2017, and had been campaigning in the 49er with crew Ryan Donaldson. Discussing the changes to their campaigns, and change in crew position, Lachy was positive about their current situation. But it hasn’t all been plain sailing for the Australian team so far this Olympic cycle. While 2017 included multiple international podium results, 2018 by their own admission did not produce the kind of results these sailors have come to expect. Reflecting on the past two years, skipper David Gilmour believes he and previous crew Joel Turner performed well as a team in 2017. They placed 3rd at the Aarhus Worlds test event, 2nd at the Europeans and won Kiel Week in Germany. But in 2018, they finished a disappointing 16th at the Aarhus Worlds and 18th at the Europeans. “In 2018 we just couldn’t put it together,” says David. “By our own standards, it’s definitely not good enough”. McNicol, for the most part, agrees. “You can say that coming 10th or 15th [in the world] is an okay result, if you like. But if you want to be measured at an Olympic medal standard, it’s probably not good enough”. This is a sentiment reflective of the entire Australian 49er team. With such historical success, it’s understandable why the Australian Sailing Team isn’t satisfied with simply competing. This Olympic cycle is what some people would call a rebuilding period for the Australians. 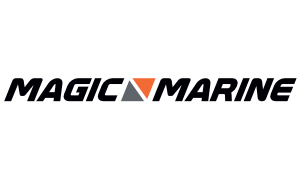 Teams from the most lucrative and professional sports in the world are accustomed to this: a team will develop it’s athletes, reaching the top and often holding that standard for multiple years. As their athletes grow older and retire, and the results decline, the team brings in new, young athletes, and if well managed, the cycle repeats itself. McNicol doesn’t subscribe to the notion that this should be seen as a negative. The mood in the Australian camp is upbeat and positive. 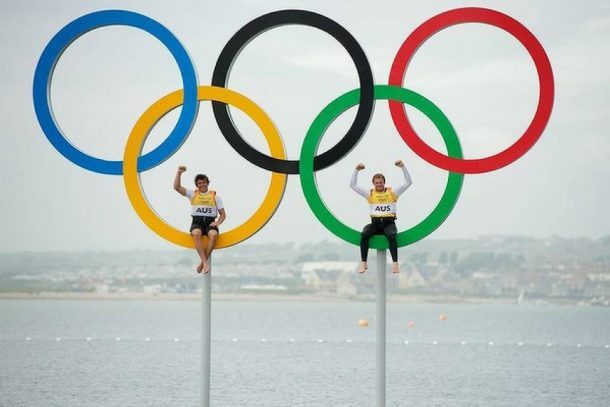 Both the sailors and coaches believe fully that they can bring Olympic success to the team. And every success starts with a plan. There is no doubt that the future of the Australian 49er team is strong. And they don’t shy away from making their intentions known. When asked where his money is for the Olympic Games in 2020, David Gilmour simply replied with one word: Us. Lachy and David Gilmour. (AUS) © Drew Malcolm. All Rights Reserved.